COMAC signs Framework Cooperation Agreement with Chengdu__Commercial Aircraft Corporation of China, Ltd. 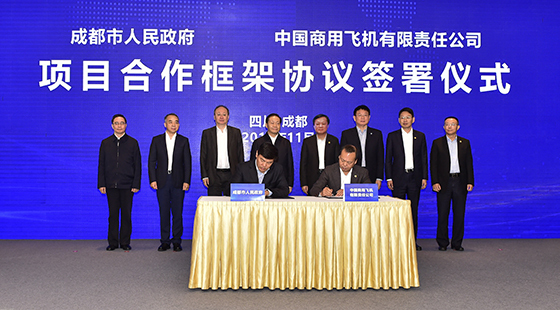 The signing ceremony of a Framework Cooperation Agreement between Commercial Aircraft Corporation of China, Ltd. (COMAC) and Chengdu Municipal People's Government was held in Chengdu on November 19th, 2018. 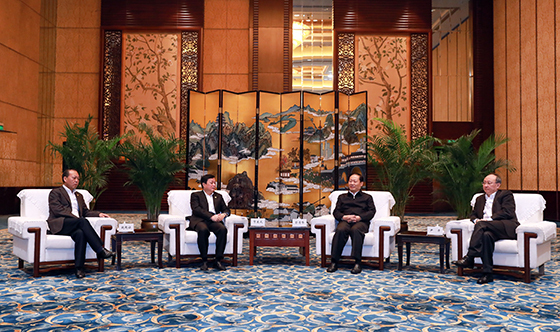 Mr. Peng Qinghua, Secretary of the CPC Sichuan Provincial Committee, Mr. Yin Li, Deputy Secretary of the CPC Sichuan Provincial Committee and Governor of Sichuan Province, Mr. Fan Ruiping, Member of the Standing Committee of CPC Sichuan Provincial Committee and Secretary of CPC Chengdu Municipal Committee, Mr. Peng Yuxing, Vice Governor of Sichuan Province, Mr. Luo Qiang, Deputy Secretary of the CPC Chengdu Municipal Committee and Mayor of Chengdu, Mr. He Dongfeng, Secretary of the Party Committee and Chairman of COMAC, Mr. Zhao Yuerang, Deputy Secretary of the Party Committee and President of COMAC, Mr. Cheng Fubo, Vice President of COMAC, and Mr. Chen Yuanxian, Vice President of Aviation Industry Corporation of China (AVIC), attended the signing ceremony. Before signing the agreement, Mr. Peng Qinghua and Mr. Yin Li held a talk, exchanged views and reached a series of consensus with Mr. He Dongfeng and Mr. Zhao Yuerang on the issues of implementing the signed cooperation agreement in detail, especially jointly promoting the development of the aviation industry in Sichuan, accelerating the construction of Tianfu International Airport and airport economic zone, and strengthening cooperation in the research and development of civil aircraft and the support of spare parts. Mr. Zhao Yuerang and Mr. Luo Qiang placed their signatures on the Framework Cooperation Agreement. According to the agreement, COMAC would develop cooperation with Chengdu in the construction of Tianfu Airport Operation Support Base, China-Made Civil Aircraft Operation Support Base, COMAC SADRI (Chengdu) Nose Design Center, and Chengdu Commercial Aircraft Software Research Institute in order to jointly promote the prosperity of aviation industry. Shanghai Aircraft Design and Research Institute (SADRI) signed a Framework Cooperation Agreement with AVIC CAC Commercial Aircraft Co., Ltd on jointly constructing COMAC SADRI (Chengdu) Nose Design Center.